I’ve always had a soft spot for games with good design. I asked for a copy of Chess for Christmas a few years ago and picked out the exact set I liked the best. I made the decision not based on materials or price, it was all about how the set looked. The pieces were almost traditional, but with a modern flair. And the board was stunning, polished to a high gloss. Almost too pretty to play on! That preference for design also spills over when I’m looking at hobby games to play. I purchased the entire GIPF Project based upon looks alone, even though I had never played a single game (but they are fun!). The art deco style of Trench is always an eye-catcher whenever we bring it to game night. And there have been so many gorgeous abstract games in our Thrift Treasure series that it would take all day to tell you about them. 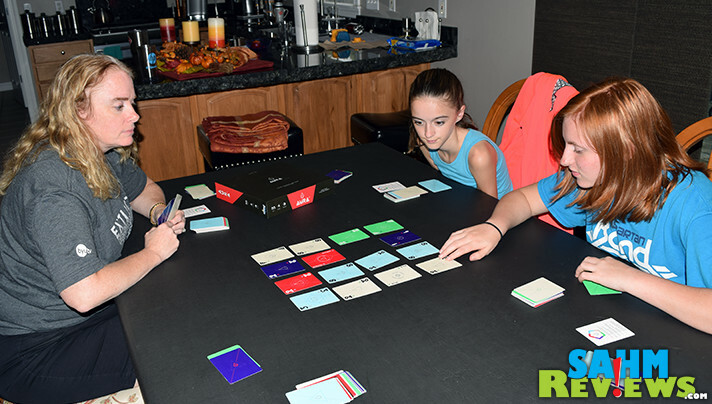 Usually good design is seen primarily in traditional board games. I can’t think of the last time I said the same about a card game. Card games are usually more utilitarian, having stats, values, actions and pretty photos in whatever theme the game is designed around. 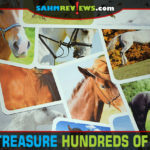 Simple games can get by with a standard 52-card deck, while today’s titles try to pack as much complexity and strategy as possible, creating the need for so much information on the 2 1/2″ x 3 1/2″ card stock. 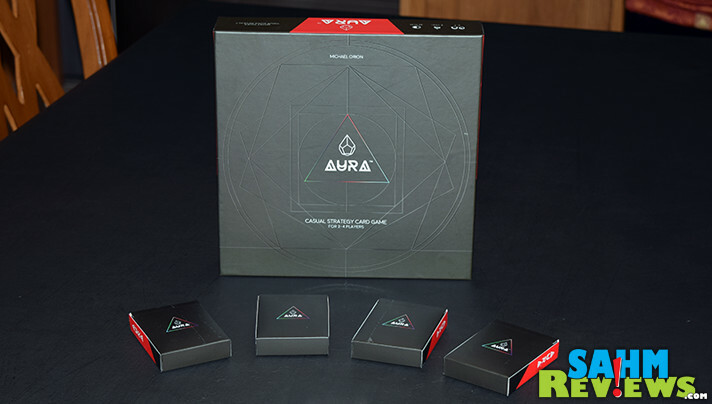 We recently came across Aura by Breaking Games that bills itself as a “casual strategy card game”. The minimalist black box with spot-gloss geometric patterns hinted about design being as much a part of the game as the rest of the components. That’s exactly what we found. 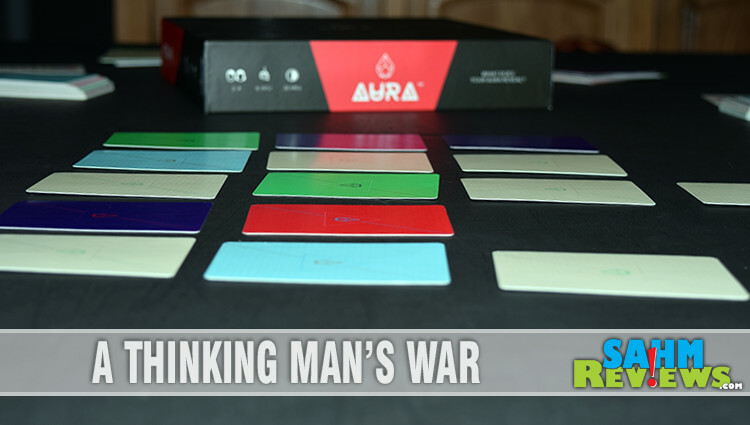 If I were asked to compare Aura to another game, it would be the classic card game of War. But that might be over-simplifying things, since Aura has more going on that simply turning over two cards and seeing which is highest. A LOT more. 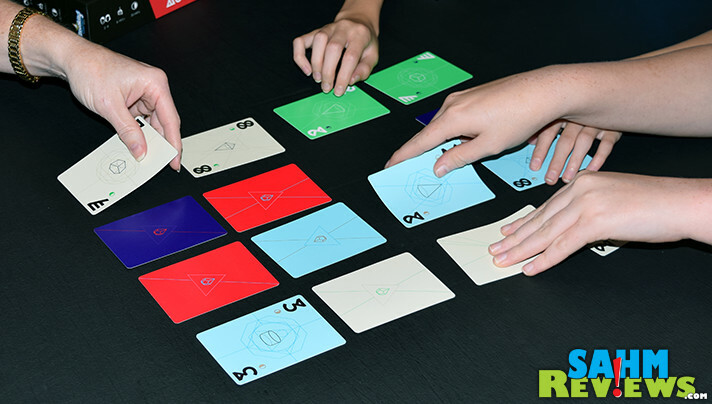 Designed for up to four players, each person receives an identical deck of cards made up of five ‘suits’ represented by unique colors. Each of these suits has eight cards numbered one through eight, a wild card and an action card. Players also receive a handy reference card which will be needed to help you remember which color trumps which. 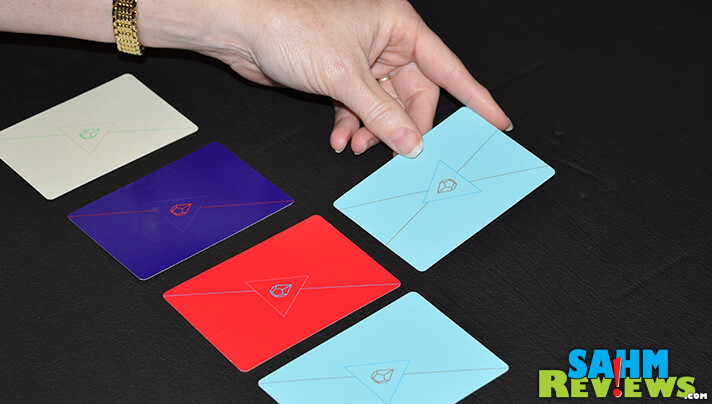 Interestingly, all cards have their suit color also on the backs so your opponents can see which suits you are holding. Starting with a hand of eight cards drawn from your shuffled deck, if you are the active player you will lay face-down between two and five cards to the center of the table. 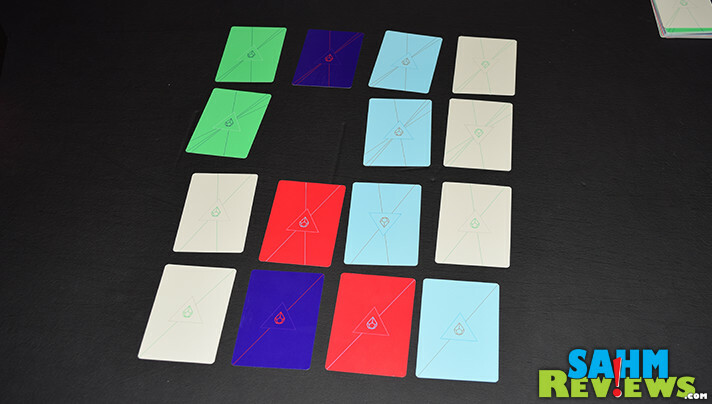 Other players, seeing the suit you played, will then lay in turn order cards from their hands to try to block/beat your card. At this point no one knows the values of the cards, just the color. To block your card, they must either play a card of the same suit but with a higher number, or play any card of that suit’s trump color (red beats purple, purple beats green, etc.). Hence the need for the reference card! 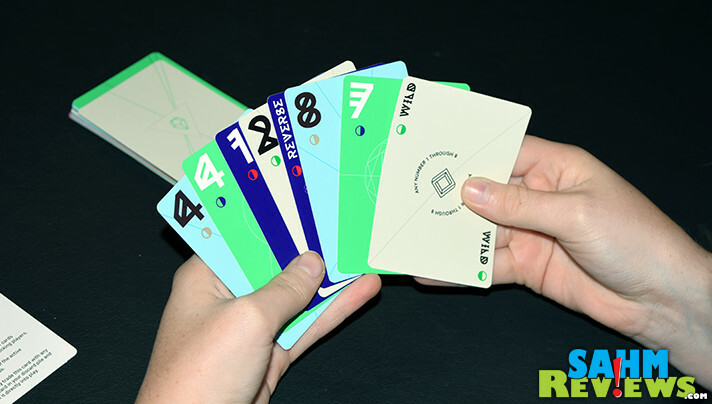 Once all players have laid their cards (they don’t have to lay the same number of cards, they can choose to leave some cards unblocked), all cards are revealed. Any action cards played are resolved first and might include allowing a return of any card to the owner’s hand, trading with one in your discard pile or even reversing the rules, making unblocked cards blocked and vice-versa! (Yeah, that one hurts our head too). There is also something called “Chains”, where the active player can play cards of the same value and have them chain together to make a more powerful attack. These cannot be blocked unless the defender manages to block them all! 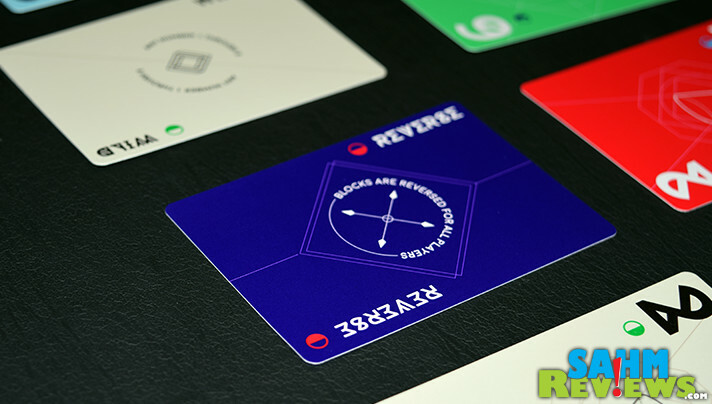 Each defenders’ cards are resolved against the active player and they must discard from the game cards equal to the number of unblocked cards. These can come from their hand, the play area or their draw deck. Any cards left on the table are returned to the bottom of their draw deck. Once someone’s draw deck is cycled through (the Aura card is put at the bottom of the deck at the beginning of the game to keep track), the deck is reshuffled and the Aura card is once again placed on the bottom. Once this card comes to the top again (second time through the deck), the game ends after the current turn and the player with the most remaining cards in the game is the winner of Aura! My disclaimer – I love the game of War. It was my go-to 2-player game growing up and still love playing it today with my girls. At first I thought Aura was just a variation of War, and I guess technically it is. 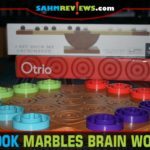 But it really is so much more, and the fact that it supports up to four players means the whole family can get involved. Because of the addition of action cards and the ability to chain cards together, there is a whole lot more strategic thinking needed to be successful at Aura. Use the form below to enter to win a copy for your collection. If you want to guarantee you’ll be able to play with friends, you can find copies on Amazon for around $25 shipped or direct from Breaking Games on their website. 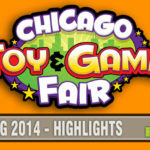 Make sure you’re following them on Facebook or Twitter as we hear rumors of some great new titles on the way. I know you’ll want to be among the first to know! What the Flock? Check Out 4 the Birds! No, I have not played the classic card game of War yet. I have, and still occasionally play it with my nephews. I used to play War with my sister all the time, it was one of her favorite games. I have definitely played War before…my sister & I used to LOVE that when we were little. And my kids love to play it, too! Yes, I have played the card game War. Oh yes, I have played war many, many times as a child and teenager. 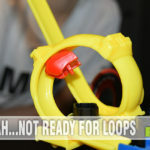 Not so much now, though my nephew occasionally challenges me to a game. Thank you for the chance to win. Yes, I have played War. War was a favorite in my household when I was a child. I played that a lot as a kid. I have never played game of war. I’ve never played War before.